Tracery seamless pattern. 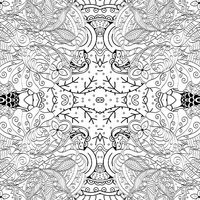 Ethnic binary mehndi doodle texture design. Vector. Tracery seamless ornament. Ethnic mehndi curved doodle design. Vector. Seamless tracery geometry ornament. Black and white binary template. Vector. Seamless Chinese window tracery diamond geometry line pattern background. Seamless Chinese window tracery lattice geometry pattern background. Seamless Chinese window tracery square geometry pattern background.